We have had many questions pertaining to trusting the LED light on the new modern relays. The following information explains a simple way to quickly test a relay with or without an LED indicator using a Mag-Probe. You can trust the LED on the Mag-Probe because it is a completely self contained test instrument that can be used in any environment. It can be used in extreme explosive, hot, cold, wet or underwater applications. This makes the Mag-Probe test instrument invaluable in the gas and oil industry. An LED in a modern relay is used to indicate that voltage is present. But, it does not tell you if there is current flowing through the relay coil. However, when the Mag-Probe LED light turns on you instantly know you are detecting the magnetic field in the relay coil which instantly tells you have voltage current and continuity. Remember whenever you detect a magnetic field around an solenoid valve or relay coil you instantly know you have voltage, current, and continuity, and it only takes one test. The ultimate objective when testing modern relays is simplicity. The reason engineers and technicians use the Mag-Probe is to save time by separating electrical problems from mechanical ones. Modern relays that have an LED light do not give you all the information you may need to make an accurate test. In one quick test you will be able to separate an electrical problem from a mechanical one on any relay using a Bartol Mag-Probe. You will also know you have voltage, current and continuity as soon as the magnetic field around the relay coil is detected. It doesn’t matter if you are testing old relays or a modern relays the testing procedure is the same. The objective when trouble shooting solenoid valves and relays is to decrease downtime which in turn will increase incremental profits. It’s that simple. The best example of the Mag-Probe’s value is the Boeing 767 flight idle control problem test. There was an intermittent problem with the flight idle control relay on a Boeing 767-300. It was loosing ground intermittently so the test had to be made while the Boeing 767 turbines were operational. Since the Mag-Probe is a non-contact test instrument it enabled the technician to conduct the test while the Aircraft turbines were running. 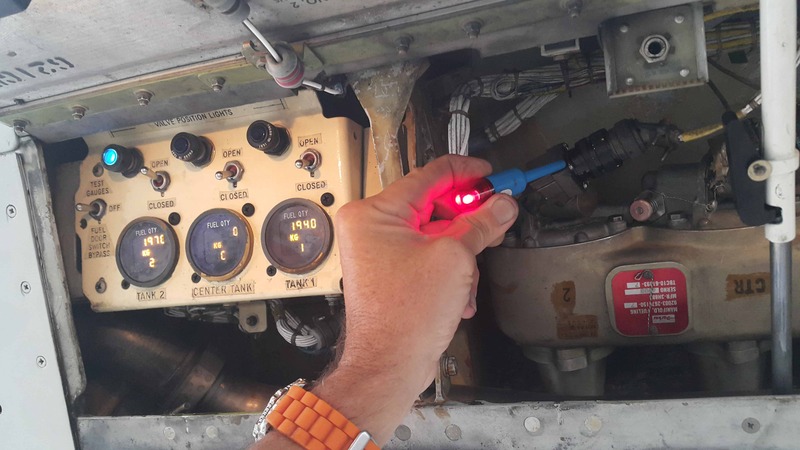 The Mag-Probe test made on this aircraft relay detected the magnetic field generated by the relay’s coil which isolated the problem as an intermittent ground connection to the relay socket. The aircraft flight idle control relay problem was now solved. No further problems have been encountered with the flight idle control relay since August 19, 2015. The plane is still flying. The international technician that solved the problem using a Mag-Probe flew back to his home Dec of 2015 Christmas on the same Boeing 767. If this problem had not been solved within 7 days the aircraft would have been grounded permanently. It would have cost Lufthansa Airlines 197,000,000 to replace this Aircraft. How many Mag-Probe’s could you buy with $197,000,000. The same principle apply when testing relays that are being controlled by PLC’s, any computer controlled relay or manually controlled relays with on/off switches. To order a Mag-Probe or get more information on the Bartol Mag-Probe call 208-321-7566 and ask for Bob.